Groundhog Mountain – Let's Go RVing! It rained again last night and looked a bit dreary when I finally woke up after 7:30 – boy, that shapenote singing wore me out! The sun eventually came out and we went for our morning walk and it was a great morning for it but the walks are strenuous. I repeat – I am a flatlander! I have often read of runner’s describing their legs as feeling like jelly and now I know how that feels. We ate lunch in the rig and then headed out to Mabry Mill. This time we took a left! Although we had directions from the office I programmed the GPS. Poor Gypsy kept losing the signal and telling us to turn left, or right, on the road. 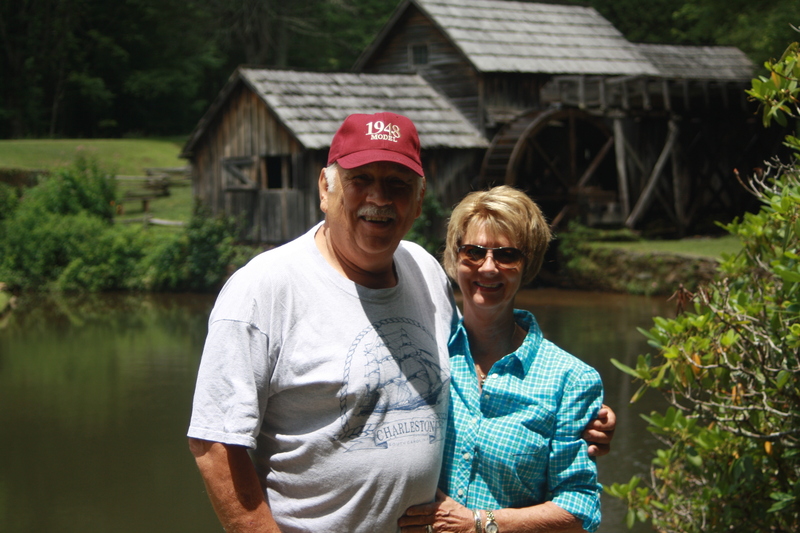 We went straight to Mabry Mill. It is a lovely place and definitely a photo opportunity as was evident by the many people and cameras abounding. The mill itself is beautiful and still in operation making corn meal. We chatted briefly with a spinner who was making thread out of sheep’s wool. She made it look so easy but when I asked her how long she’d been doing it she replied 30 years. That’s why it looked so easy. After Mabry Mill we drove back along the Blue Ridge Parkway. We approached one lookout and it was so heavily treed that it really wasn’t a lookout but the sign said Pilot Mountain and just as we passed it we both saw the knob of Pilot Mountain. Our next stop was Groundhog Mountain. It was just a picnic area with a very pretty vista. There was some type of two story outlook building on the property and after climbing the narrow staircase you could look in all directions at an exquisite view. Our next stop was a little cabin on the side of the road. It had belonged to “Aunt” Orelena Hawks Puckett, a midwife who lived to be 102. She delivered over 1000 babies and never lost one because of her own negligence. Sadly enough although she had 24 children none of hers survived infancy. How sad that a midwife had no children of her own. Our next brief stop was at a lovely stone church, Bluemont Presbyterian still in operation. We took a couple of pics and then headed on to Hillsville for groceries. Between Hillsville and Fancy Gap there is an absolutely stunningly beautiful home but it is deteriorating. It had turrets, stained glass windows, leaded glass windows, wonderful dental molding (some of it missing) and a No Trespassing Sign outside. It is so pretty and makes one wonder how and why such a home would go to ruin. It could be beautiful and would cost a mint to fix it up but what it would be! Back to the campground for a lazy afternoon reading and making more ice cream. I hate to think how much weight I am gaining! The campground is slowly filling up as we now have neighbors on both sides. Wonder what’s going on. So glad we are staying here. We had earlier seen signs for another campground nearby so we took a spin through there earlier today. At $28 a night it seemed a bargain but it appeared to be permanent residents as their sewer line was covered with PCP pipe. Not a tree nor a person in sight – we made the right choice. 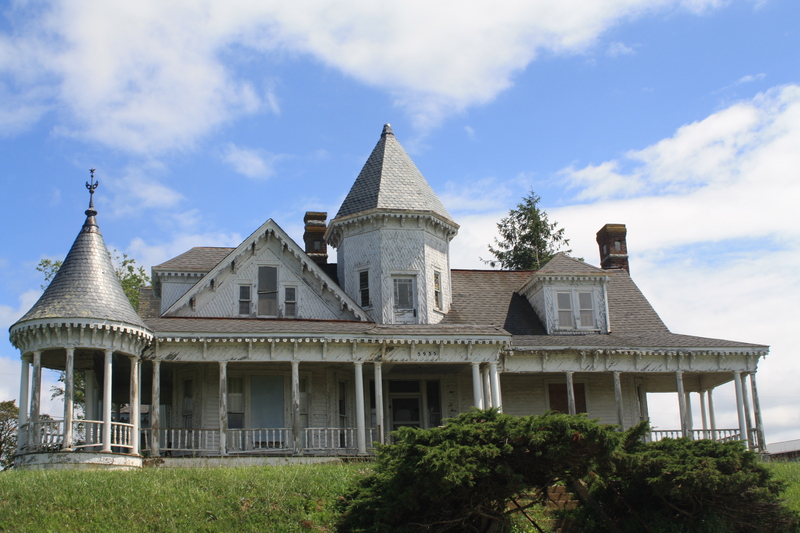 Between Hillsville and Fancy Gap there is an absolutely stunningly beautiful home but it is deteriorating. It had turrets, stained glass windows, leaded glass windows, wonderful dental molding (some of it missing) and a No Trespassing Sign outside. It is so pretty and makes one wonder how and why such a home would go to ruin. It could be beautiful but it would cost a mint to fix it up. Back to the campground for a lazy afternoon reading and making more ice cream. I hate to think how much weight I am gaining! The campground is slowly filling up as we now have neighbors on both sides. Wonder what’s going on. So glad we are staying here. We had earlier seen signs for Utt’s Campground so we took a spin through there earlier today. At $28 a night it seemed a bargain but it appeared to be permanent residents as their sewer line was covered with PCP pipe. Not a tree nor a person in sight – we made the right choice.